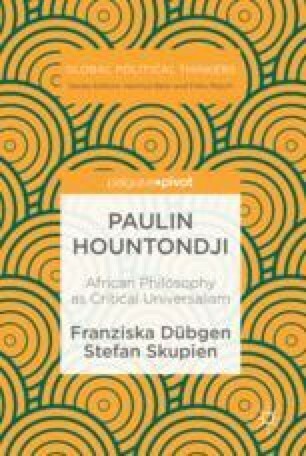 This chapter contains an interview by Franziska Dübgen and Stefan Skupien with Paulin Hountondji, held in 2018. Therein, Hountondji reconsiders his early critical stance towards ethnophilosophy, arguing for a sociology of collective representations as a means to adequately study collective thought. He recounts the period of democratisation in Benin during the 1980s and his involvement in this process as a university professor. Recognising the need for a decolonisation of the educational system in the postcolonies, Hountondji demands ending extroversion by producing scholarship for an African readership, through the critical reappropriation of African and non-African knowledge and the use of African languages for scholarly activity.